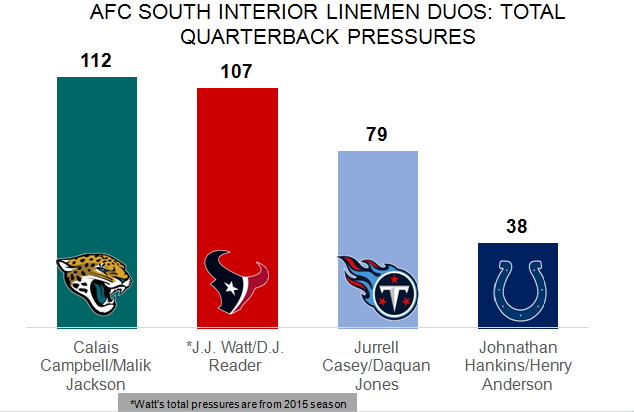 By pairing newly signed Calais Campbell with 2016 marquee free agent signing Malik Jackson, the Jacksonville Jaguars now have one of the league’s better interior defensive duos. Campbell is coming off a year in which he posted a career best PFF grade of 90.4 which ranked second among all eligible defensive lineman. In the last six seasons, the lowest season grade Campbell has recorded is a still impressive 84.8. He finished in the top six of all eligible defensive lineman in the five other seasons. The lowest PFF grade Jackson has recorded in the last four seasons is 81.6, which he then followed with the two best seasons of his career to date. What really makes this duo imposing for opponents is their ability to pressure quarterbacks on the interior. In 2016, Campbell and Jackson combined for 112 total quarterback pressures. As the Jaguars still have young players on the edge, the immediate pass rush contributions of Campbell and Jackson could dictate a big role for potential early season success.